As 'The Works' grows ever closer to completion I have been giving a lot of thought as to what to do next and have decided that, as I'm now happy that I can 'do' P4, the next layout will be somewhat more ambitious and is to be a depiction of South Pelaw Junction on the Tyne Dock to Consett Line. It is a location I find fascinating not least because I'm old enough to remember the junction being there and to have seen trains running on the line as it went past the bottom of the playing fields of my comprehensive school, it is just a shame that I wasn't interested enough at the time to have documented or photographed the site as, of course, very little remains now. * The track plan remained as it was in 1970 with the lines to Stella Gill still intact. * Passenger services did not end in 1955 which will allow the running of DMUs on the passenger service. * The line did not close in 1983, the assumption will be made that the steelworks in Consett closed in 1995 instead. * At least one coal mine on the route remained. The Templot track plan is shown below. The blue lines at either end are the 2 bridges that, very conveniently for the purpose of scenic breaks, were at either end of the junction. The scenic section of the layout is to be 18' * 3' which will allow for a full size representation of the junction with no compression. 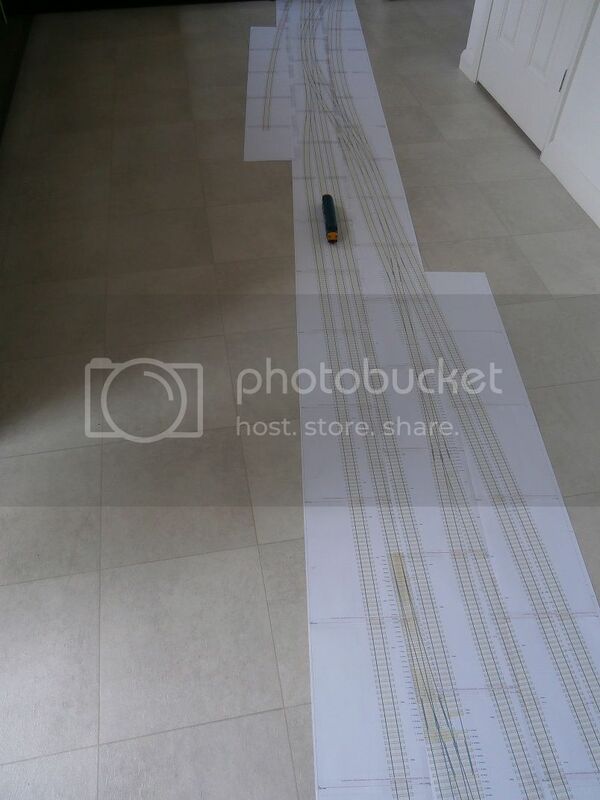 By the very nature of the size of the layout, this is to be a very long term project with the first task to start to build up a collection of rolling stock for the layout as, for the time being at least, I don't have a room big enough to erect the layout to it's full size. During my research so far, I've managed to get a hold of a number of photographs of the site so I've put together a website (early days still) http://www.southpelawjunction.co.uk to show the photographs (with full permission of the owners of course) as well as a number of 'then and now' photos of the location. 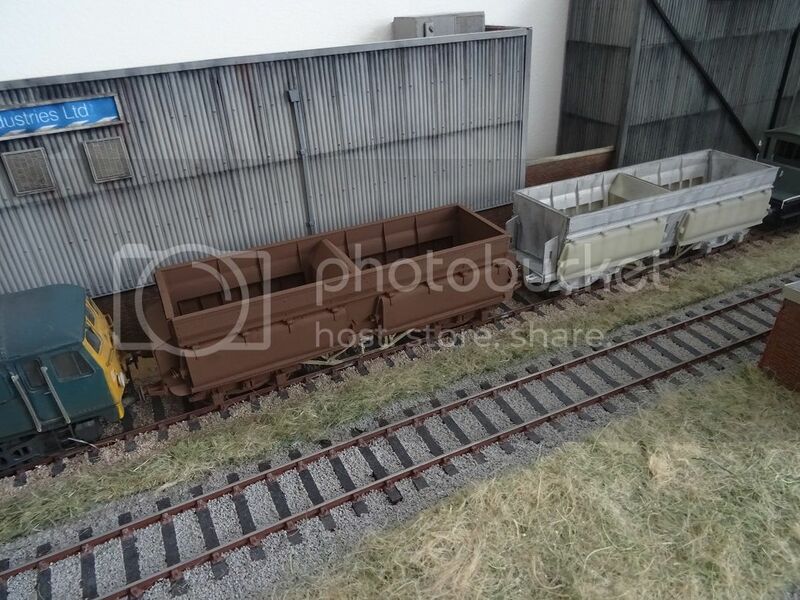 Looks like a fascinating idea for a layout. The junctions and the signal cabin really catch my eye whenever I have seen the place in photos. That looks rather fantastic as an idea; especially if you keep the interest with the DMU service. The guys doing it in EM are also doing a great job of it! Did the North Eastern Electrics run on that part of the line? Just another challenge. Terry Bendall wrote: Did the North Eastern Electrics run on that part of the line? Just another challenge. The 2 thick blue lines represent the bridges that form the scenic breaks. The main fiddle yard (which has yet to be designed) will be at the bottom. I've also extended the Stella Gill lines in to a fiddle year of their own although this will be a nice to have rather than a necessity. Almost there with the plan I think. 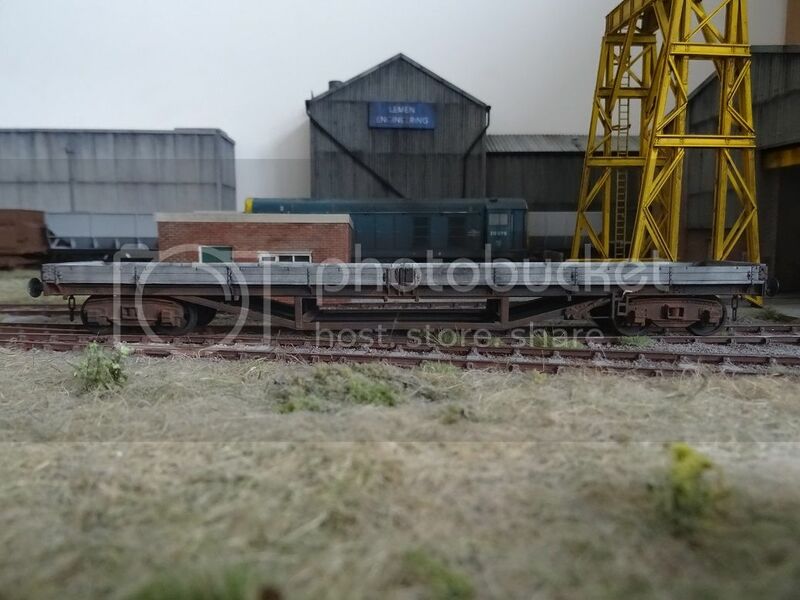 There are now 2 fans of loops in the fiddle yard which can be accessed from the Washington, Ouston and Consett lines so are fully bi-directional albeit with some pretty complex track work, particularly at the Consett end of the yard. 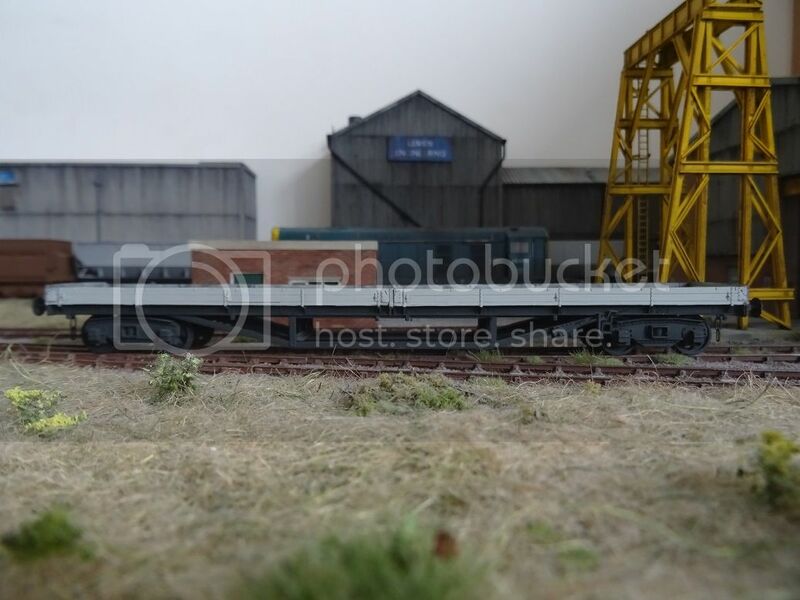 The Stella Gill sidings can act as a fiddle yard in themselves so there will be plenty of storage space there with a run right through back to the Washington line. This will allow me to sit back and watch 4 trains running at once. It's the enormity of the mortgage to house the thing that would really scare me! Crepello wrote: It's the enormity of the mortgage to house the thing that would really scare me! 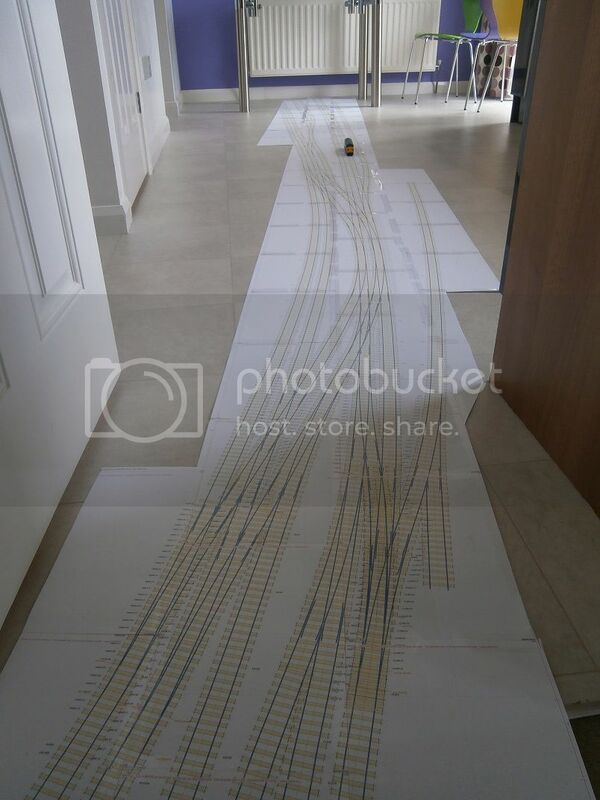 There is at leats one large p4 layout in existant where the builder only had room to put up two baseboards at a time. It can be done but may not make things easier. The plan looks very nice John. I've made a start on one of the iron ore wagons, using one of the new kits from Dave Alexander which uses a combination of white metal, resin, photoetch and lost brass castings. So far the kit is pretty much falling together with all the pieces fitting perfectly with only the smallest amounts of flash having to be removed with a quick swipe of a scalpel. That does look good, well done. As you say, lots of dirt required! Since they were built by BR at Shildon, were BR stock and were VB fitted, there seems no particular reason to suppose that their original colour was anything but BR bauxite. Subsequent weathering would have been considerable, as you say, not least because some ores were virtually fine dust, hence the use of covers over [most of] the bogies. They were photographed in colour on at least four occasions in steam days; I presume there are also colour photos from later periods? Noel wrote: They were photographed in colour on at least four occasions in steam days; I presume there are also colour photos from later periods? I have one colour photo from steam days but I'm not convinced that it's a genuine colour photo, it looks very much like it is a 're coloured' black and white photo. I have a number of later photos in colour but, again the wagons are so filthy, that determining the underlying colour is difficult. If it's any help, "On North Eastern Lines", Derek Huntriss, Ian Allan 1998, ISBN 0 7110 2543 6 has 4 pictures: one dated 1954 and one dated August 1956, both by D G Charlton, one dated 8/9/1960 and one dated 9/7/1960, both by T B Owen. 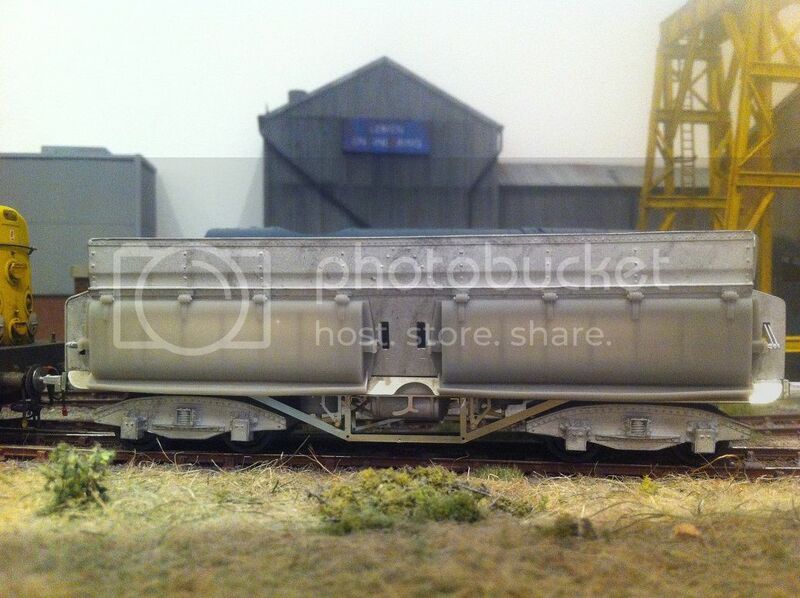 The last of those is an overhead shot of empty hoppers being placed under the loading gantry. "Steam Days" magazine December 2006 has a repeat of the 8/9/60 shot mentioned above, plus another from the same photographer on the same day in which the locos and the bogie covers are different, indicating that it is most probably a different set [or just possibly the same one but turned round]. All the wagons are quite filthy. There are differences in the colours between the shots though, probably due to the variables mentioned above. So far as painting models is concerned, I would suggest that the original colour is probably immaterial. With BR bauxite the actual colour of the paint seems to have changed after application anyway [possibly because of chemical changes in the paint? ], becoming less red over time. Your approach of using a suitable [non-bauxite] base colour plus weathering seems to me to be entirely reasonable. My only comment, based on the photos mentioned, would be that there is possibly too much red in the base colour used, at least as it appears on screen? No progress on the layout itself but I'm managing to get some work in this week, the second of the iron ore hoppers is now well on the way to completion. I have to say that these kits are pretty much falling together, everything fits with the absolute minimum of fettling. They are not cheap but you certainly get what you pay for. 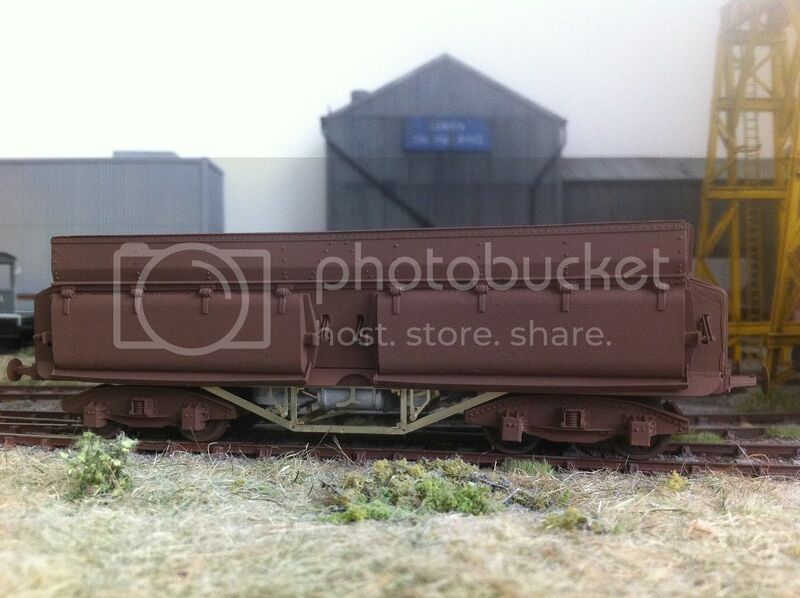 Spent an hour or so weathering a Boplate E wagon I built a while ago. Nice looking wagon building John. That should look good. 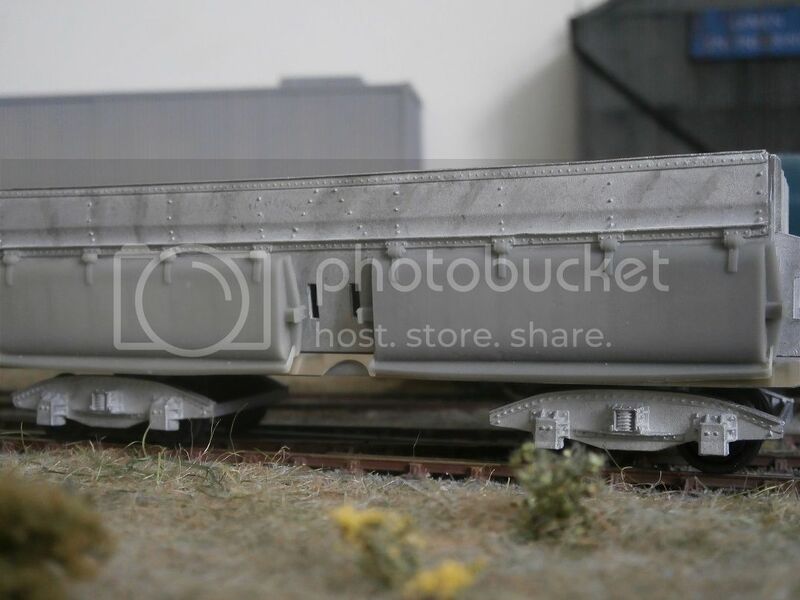 The alternative to save building so many wagons is to have removable loads and not have them passing.